If you want a Tori Kelly pillow then this is what you need. This is a throw pillow with on the front and back a portrait of the famous singer and she is while smiling biting her tongue. And the whole picture on this pillow has a yellow sepia like color to make it look even cooler. 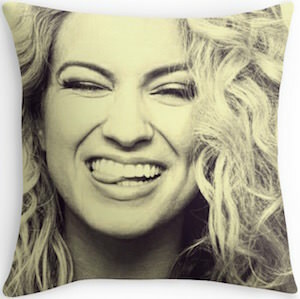 You can get this Tori Kelly pillow just like a real pillow or just as a pillow case to make you own pillow out. The Tori throw pillow is 16 inch square and would look great on a couch, chair, bed or even on the backseat of your car.